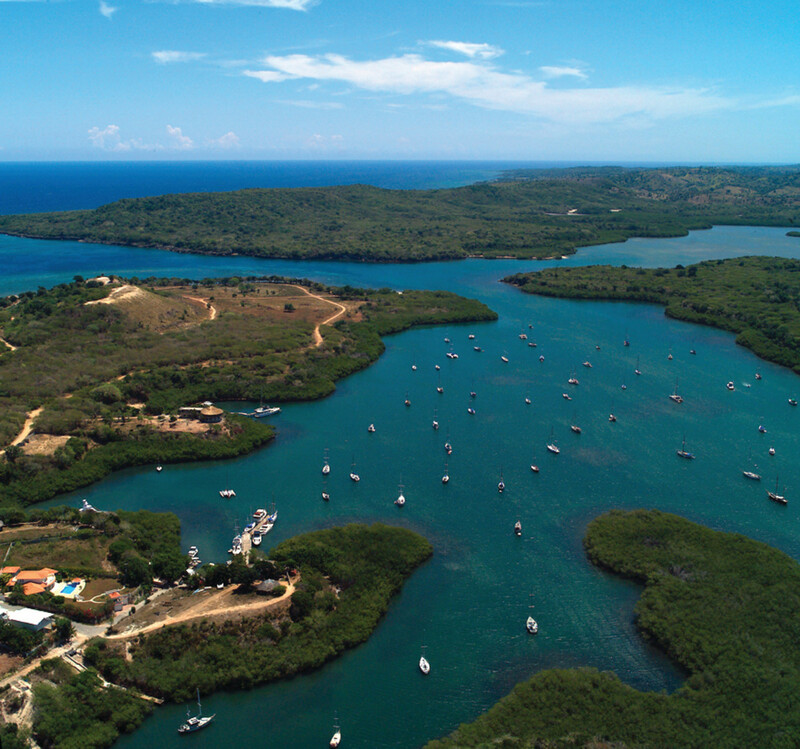 For a first-time cruiser heading down island, the route from the Florida shores to the Dominican Republic represents a thousand nautical miles of challenges, opportunities and grand adventure. As you follow coastal waterways to the Keys, transit the Bahamas and finally press on to Latin America, you will find--among many others--these four memorable places to spend time. A shippy little cruising tug lies at anchor in front of the city’s ancient fortress. Much of the waters nearby have been converted to a mooring field. The Spanish fortress at St. Augustine is truly old and truly a marvel of 16th Century military engineering. Around this factual core, as Lardner wryly observed, has developed a de facto theme park of a downtown dedicated to oldness and first-ness. It is, however, a theme park with a patina in its paint, old enough to be respectable in its own right, most of it having been rebuilt in the 1950s. 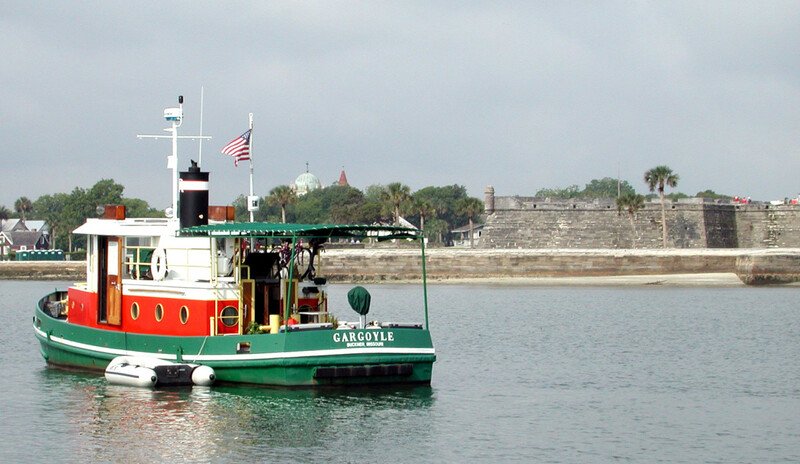 And for visiting boaters, St. Augustine is both useful and fun. Whether you are mindlessly competitive or need to entertain the kids, one inexpensive pastime here is the “Lion Game.” It’s simple: When you see a lion, say “Lion!” and punch your partner in the arm. Whoever sees the most lions first wins a margarita or an egg phosphate (whatever that may be) for the kids. If you are unfamiliar with Florida history, an explanation is in order. Legend has it that Ponce de Leon (lion in Spanish) “discovered” St. Augustine while looking for the Fountain of Youth. 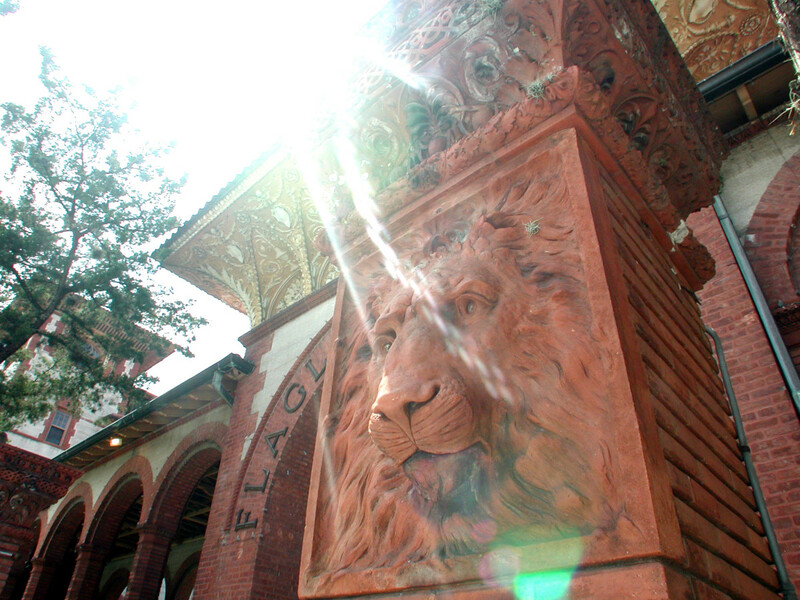 One of the themes repeated throughout this theme park are depictions of lions, whether the Bridge of Lions spanning the harbor or the statue of old Ponce himself (Lion!). Enjoy a nice walk on the live oak-shaded streets, inhale the salty air and keep a lookout for feline depictions. For boaters passing through St. Augustine, there are three convenient marinas, each with their own advantages. Camachee Cove is a first-class facility north of the St. Augustine inlet with on-site amenities, a boatyard and privacy. Unless you have a fast RIB to deploy, you’ll want a cab or courtesy car to get downtown. The Conch House Marina lies on Salt Creek, south of the inlet; it’s got new floating docks as well, but with a tavern on the wharf, it maintains a funkier atmosphere. That atmosphere is cooler in the literal sense, being the marina most exposed to the ocean breeze. I would be remiss if I failed to mention Reggae Sunday, a hugely popular summer tradition honoring consumption of alcohol, island music and the occasional indecent exposure. Younger cruisers may be better off at the local Ripley’s Believe It Or Not Museum for the afternoon or visiting the monsters of the Alligator Farm. The St. Augustine Municipal Marina is best for its access to the attractions of downtown and now offers a cheap alternative to renting a slip. In 2010, the city installed 162 state-of-the-art helical screw moorings. The $580,000 project includes a pump-out boat, launch service and rack storage for dinghies. Transient moorings for out-of-towners run $20 a night for moorings by downtown, while Salt Run, with less access to amenities, will cost them $14. Before the new millennium Boot Key Harbor at Marathon was like a pirate town, full of liveaboard boats in various states of repair. After Hurricane George in 1998, 250 damaged vessels that had to be removed from the harbor. At the urging of local businesses, the city went on to establish a well regulated mooring field, beginning with 25 rental balls in 2003, eventually expanding to 220. The mooring field dramatically reduced the area where one could anchor for free. At the same time, no-discharge restrictions were enacted and enforced by police; officers came aboard to ensure that effluent was not being pumped into the harbor. 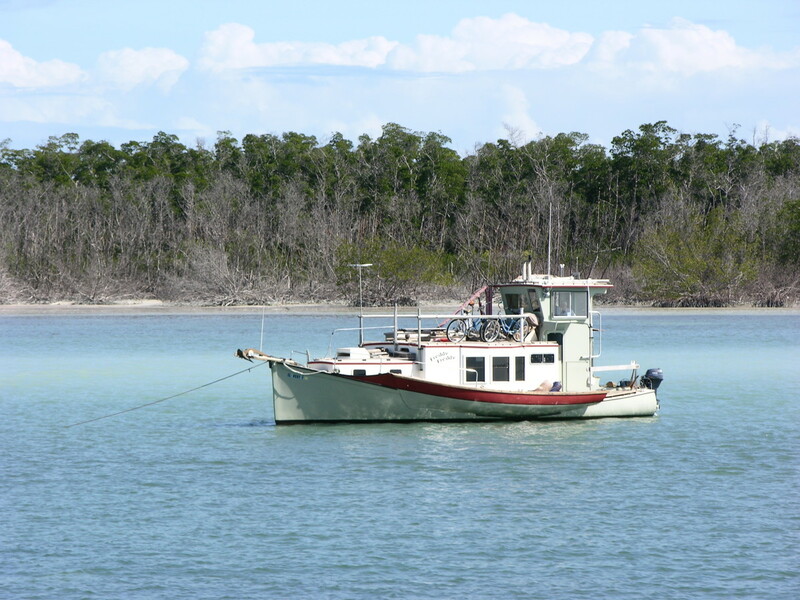 This character boat occupies an area outside the Boot Key Harbor, where anchoring is still allowed. Anchored boats had once housed an "outlaw" element in the harbor. The effect of these to measures was to drive away the outlaw element in the harbor, though some critics contended that conscientious cruisers of limited means were also forced to leave. 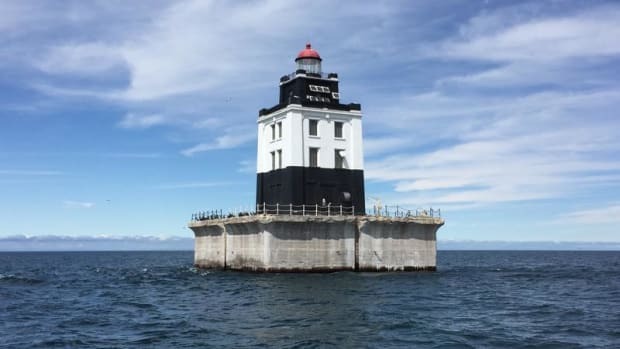 Now the city’s pump-out boat handles 16,000 to 20,000 gallons of sewage a month that would otherwise have been discharged into the harbor during peak season. The sign outside the American Legion said, “Free Elvis Tonite.” Who could resist? Now a different breed of cruiser inhabits the harbor, and transients come and go. Marathon is regarded as the last affordable place for a southbound boat to layover. Stores of all kinds, including marine supplies, are a short walk. There are boatyards for repairs and a cadre of local electronics technicians. Marathon is an excellent place to stage for a cruise of the Bahamas or Caribbean islands. 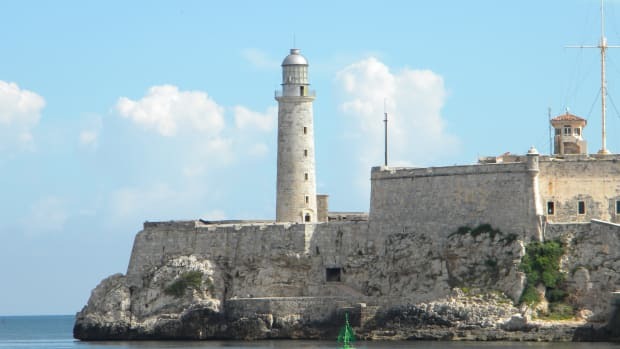 And the city is positioning itself to become a port of entry once the U.S. allows us to travel to Cuba by boat. And like much of the Florida Keys, the city retains an element of goofiness that appeals to fun loving people. It is home to the notorious Brass Monkey, a funky, smoke filled saloon not far from the harbor. Or you might be passing by the local American Legion Hall and be tempted--as many before you--to enjoy a night of “Free Elvis” singing for tips. You’re welcome. 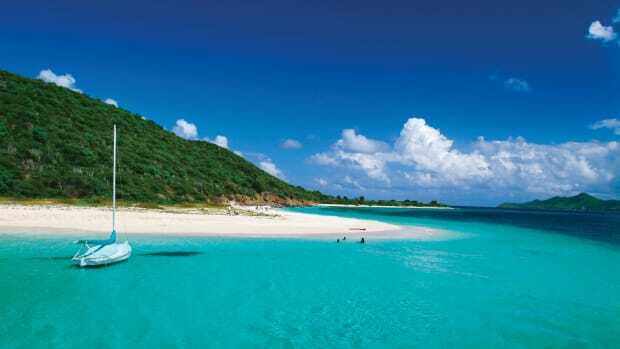 Aficionados of bad James Bond films will recognize Staniel Cay as the setting for the underwater scenes in “Thunderball.” “Splash,” too, was filmed there. The cameramen had it easy; the water hereabouts is a clear as the gin in 007’s martini. Staniel is roughly midway down the Exuma archipelago and worth a week out of anyone’s laid back cruising schedule. It’s a charming place rest a while or wait as a passing “norther” clocks through. 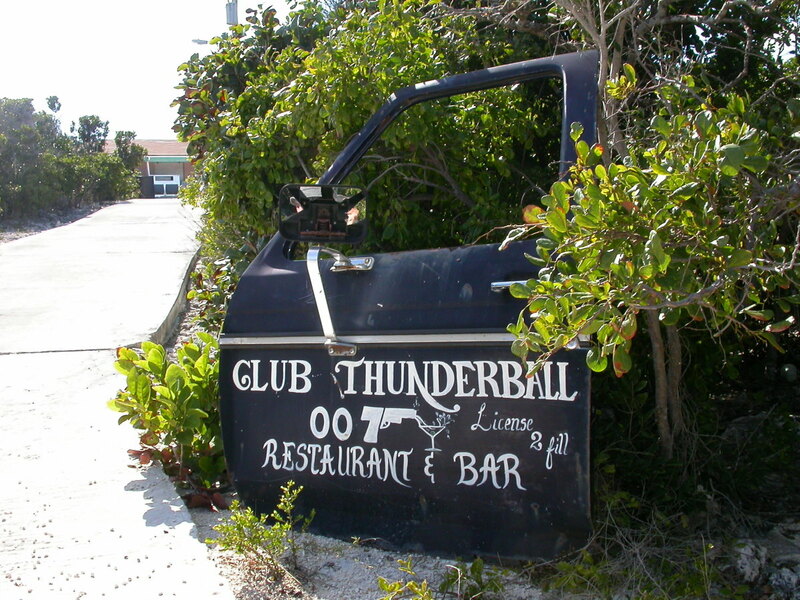 It’s been almost 50 years years since James Bond came to Staniel, but the franchise still has cache on the island, one of the most pleasant stops in the Exuma chain. 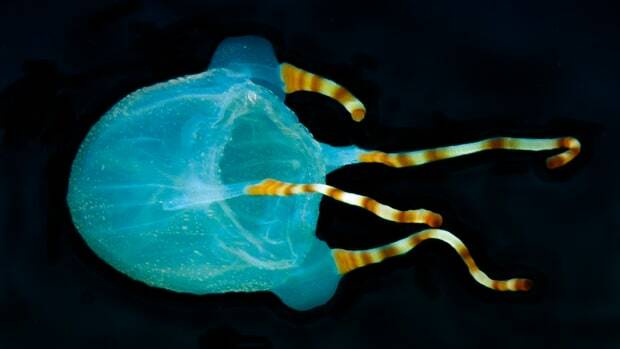 The immediate vicinity has four anchorages, each with its own virtues. One is beside the Staniel Cay Yacht Club and Marina and the village. Another lies beneath a bluff beneath the Club Thunderball restaurant and bar, a cruiser favorite. Another offers 360-degree protection for those winter cold fronts and their vigorous clocking winds. 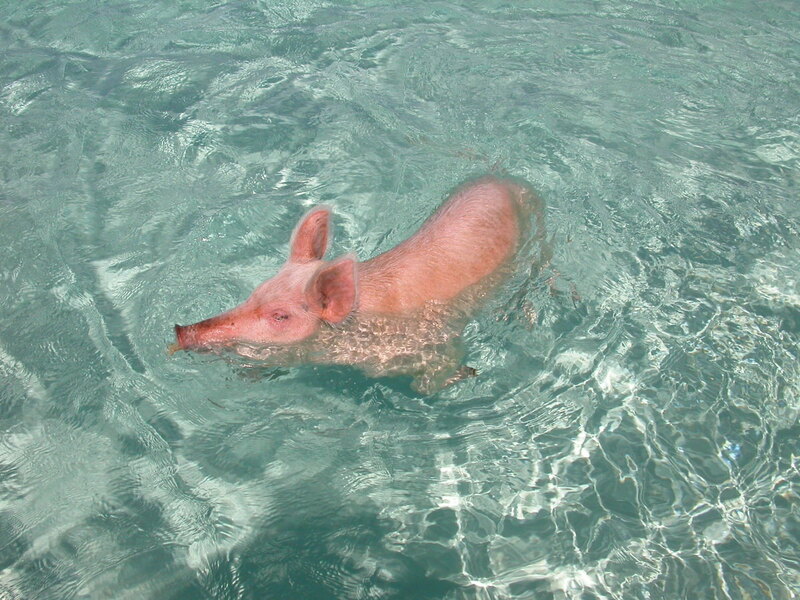 And the fourth boasts a sugar sandy beach and …pigs. Every year the friendly people at Staniels drop off a few young pigs on adjacent Big Major’s Spot, otherwise uninhabited. The expectation, borne out by years of experience, is that the pigs will be fed leftovers from cruising boats in the anchorage. And at the end of the season…well don’t tell the kids. 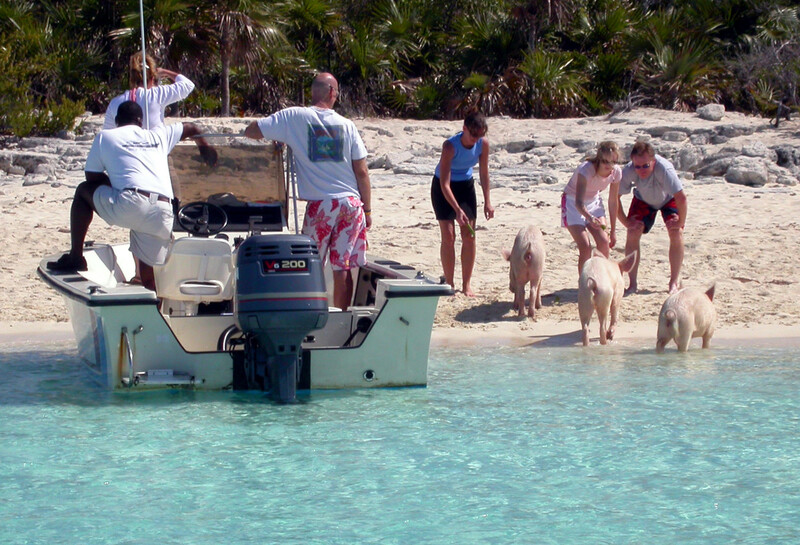 Feeding the pigs is a tradition for foreign boaters visiting Staniel Cay. The pigs live on the adjacent, uninhabited (except by pigs) Big Major. The Staniel Cay Yacht Club is a great institution with a friendly bar and good food. Happy People Marina has its own restaurant as well. For provisions, there are three stores--The pink store, the blue store and the far store, otherwise known as the Isles General Store, which can be reached by taking the dinghy up Staniel Cay Creek. Sometimes you have to visit all three to aquire all the ingredients of a meal. If you need to make a crew change, the island has an airstrip with regular flights from Florida and Nassau, not cheap but very convenient. Thunderball Cave, which is cut into small cay off the yacht club, is a must-do for anyone with snorkeling gear, and who comes to the Bahamas without it? Bring bread crumbs or even bananas to feed the brightly colored fish that greet you. Like the pigs nearby, they will be waiting. 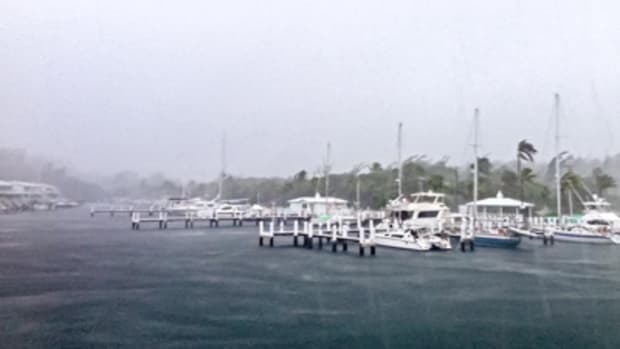 Luperon Harbor is well protected and is usually host to at least 70 cruising boats at anchor. With an area the size of New Hampshire and Vermont combined, the country has dozens of beach resorts but also miles of empty beaches, seemingly endless stands of palm trees, cactus deserts, cattle ranches and farms as far as the eye can see. In some places the topsoil is more than 18 feet deep. Unbeknownst to many, more than 60 Dominican mountains stand taller than any on the East Coast of the United States. The tallest is Pico Duarte at 10,094 feet. The D.R. also boasts the lowest point in the Caribbean, Lake Enriquillo with a population of crocodiles. For the nautically inclined, a caveat: The Dominican Republic is a country best seen by land. Unlike Cuba, the D.R has few natural harbors. Luperon on the North Coast, however, is just about as good as it gets. Luperon is safe against both the malevolence of nature and predations of man, which is what cruisers need if they’re going to leave their boats and explore the countryside by rental car. 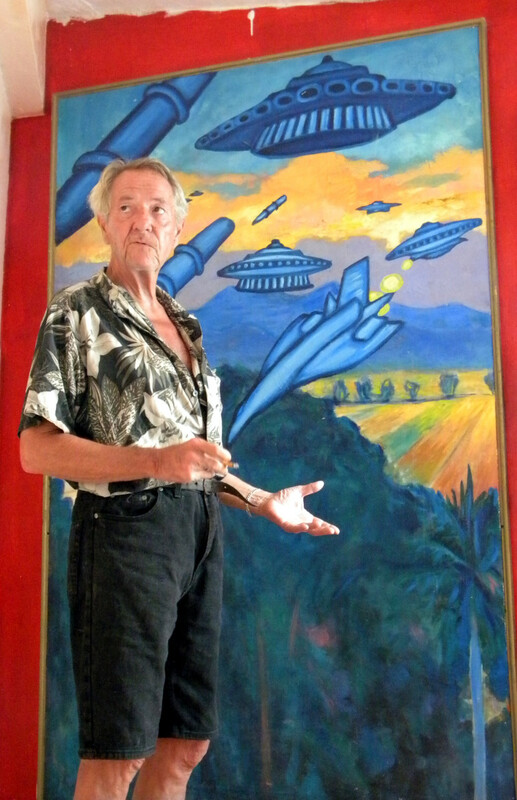 Luperon itself has developed its own quirky gringo community of expatriates, many of whom first arrived by boat with the intention of staying a few weeks and never left. Geography has made Luperon a great hurricane hole for reasons that are obvious and some that are not. A narrow entrance opens into two basins, both of which are surrounded by hills and have sticky muck for holding. But it has a topographical advantage as well. The best shelter in the world isn’t much good if the location itself is a hurricane magnet; the opposite is demonstrably true in the case of Luperon, which has not had a direct hit since hurricane tracking began in 1851. Luperon itself is a little unkempt but otherwise a typical seaside Dominican village, subsisting on fishing, agriculture and tourism from a single nearby all-inclusive resort. Over the years, however, several institutions and resources have established themselves in Luperon to serve the growing number of gringos arriving by boat. And while crime increases throughout the Caribbean, the harbor remains remarkably free from thieves and thuggery. Puerto Blanco Marina, with dockage for about 20 vessels and an open-air pub, was Luperon’s first real cruiser hang-out, with a policy of extending its welcome to anyone in the anchorage. Marina Tropical is the newest facility, offering dockage, haul-out services and dry storage on site. To all the above add the sinful pleasures of local rum, beer and Dominican “chicas,” and you have the formula for “Luperon glue,” stuff that has sabotaged many a scheduled departure.